Q: I have been renting out my townhouse for about nine years without a problem until the current renters. They have lived in my rental home for five years, and recently moved out. There are long cuts in the linoleum flooring in the kitchen, which appear as though someone took a knife to the floor, but is more likely caused by moving furniture. Estimates are greater than $1,000 to replace this flooring since it requires one continuous sheet that covers the entire kitchen and bathroom, about 450 square feet. Labor costs more than the product at $1.75 per square foot. There are also a couple of permanent stains on the flooring, one from a mat that they had on the floor that left a long black mark that does not come out. I discussed these damages with the tenant, and he insists he will take me to court to fight any withholding of his security deposit, even after I agreed not to charge him for the entire cost of the floor because it was not new when he moved in. The floor was about nine years old. There is other damage, too, such as several oil stains in the garage, and a smell of smoke that lingers in the garage, even though my lease states that no smoking is allowed. I have photos and the walk-through checklist that the tenant and I completed together when he moved in. It clearly states in my lease that the home is to be left in the same condition as when he moved in. If he takes me to court, do you think a judge would rule in my favor? A: As a landlord, you are allowed to make deductions from your tenant’s security deposit for a debt that is still owed by that tenant, such as unpaid rent or utility bills, or for damages to your place that are beyond ordinary wear and tear. The law in Minnesota does not require that your tenant leave your rental property in the same condition as when he moved in. Some damage from your tenant is considered acceptable since a tenant who lives in your home for five years is going to have five years’ worth of wear and tear. Ordinary wear and tear is subjective and may depend on what a judge believes is fair. Landlords have the burden to show that they have a right to keep all or part of their tenant’s security deposit, which means you’d need to prove in court that your tenant caused damage beyond ordinary wear and tear. When considering damage, courts will look at the value of the damaged item at the time the tenant moved in and the cost to repair the item. Flooring, such as tile, linoleum or carpeting, is depreciated for tax purposes, and that affects its value to the landlord as an asset. 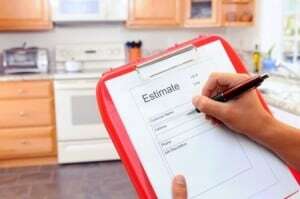 If the linoleum has been totally depreciated, then it has no value, and even if your tenant ruined the floor, you can’t charge the full amount for a brand-new floor. It sounds like you did walk-throughs before and after the move-in, and have photos of your home’s condition, which will be strong evidence in court. However, since your flooring was nine years old when your tenant moved in, and he lived there for five years, your linoleum is now 14 years old and is worth much less even if there was no damage. Keep that in mind when you determine the amount, if any, your tenant should pay toward new linoleum. There are going to be stains and markings on nine-year-old linoleum, and those might be considered ordinary wear and tear. Oil stains on a garage floor are not unexpected, and also may be considered ordinary wear and tear, unless the floor is destroyed. Smoke odor in a garage can be eliminated, so that, too, may be viewed as ordinary wear and tear, even though your lease prohibits smoking. I cannot say whether a judge would rule in your favor since all judges are different. If you end up in conciliation court with your tenant, bring evidence, such as your “before” and “after” photos and your walk-through checklists.